Lincolnshire egg producer LJ Fairburn & Son has added another prestigious feather to its cap – the Poultry Business of the Year award. 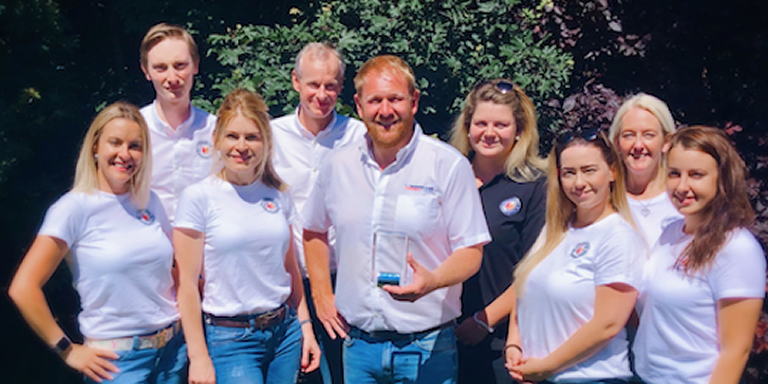 The Alford-based family firm was announced as winner of Poultry Business of the Year in the 2018 National Egg & Poultry Awards held in London. Organised by industry magazine Poultry Business and Lewis Business Media, the awards recognise excellence and innovation in the egg and poultry sectors. The third-generation family business supplies 17 million British Lion-approved eggs each week to seven leading retailers. Established in 1951 by Leslie James Fairburn with just 150 chickens bought for £150, the multi-million-pound business is now run by his grandson Daniel, alongside granddaughters Sarah and Caroline, and Daniel’s wife Sarah-Louise. Just five years ago, Fairburn’s took the decision to switch from being a contract producer for a large brand to setting up on its own. Since then it has invested heavily in state-of-the-art equipment, land and livestock, and signed contracts with many of the UK’s major multiples, plus launched its own award-winning speciality products and has actively built its own network of farming producers. It is now one of the largest independent egg producers and packers in the country, employing over 230 local Lincolnshire staff, purchasing 42,000 tonnes of feed from farmers in the county last year, as well as eggs from 21 local producers. Last year it won Family Farming Business of the Year in the British Farming Awards and last month was listed in the London Stock Exchange Group’s 1000 Companies to Inspire Britain - for the fifth year running. Awards judge Richard Griffiths, chief executive of the British Poultry Council, said: “The 2018 National Egg & Poultry Awards acknowledge the exceptional contribution made by our people in taking the British poultry sector from strength to strength.